DENVER, Colo., Aug. 5, 2011 (SEND2PRESS NEWSWIRE) — Titan Lenders Corp. (TITAN), a U.S.-based domestic mortgage fulfillment outsource operation, offering a parallel and variable cost alternative solution to lenders that need to maintain back office and warehouse line management operations, has been listed among the annual Mortgage Technology Top Service Providers. “Titan Lenders Corp. is honored to be ranked among the industry’s most highly regarded service providers, and we appreciate the commitment Mortgage Technology made to conducting an extensive evaluation of more than 100 applicants,” said TITAN founder and president Mary Kladde. “Only recently, TITAN formally announced its Whole Loan Purchase Review (WLPR) services, which we developed to support our industry’s desperate need for a return to credibility, which must precede the restoration of a viable secondary market – GSEs or no GSEs,” she added. Titan Lenders Corp.’s patented, proprietary web-based software Cerberyx (CBX) supports a full suite of mortgage fulfillment services, including: funding, compliance, closing, post-closing, purchase review for correspondents and warehouse lenders, trailing documents, MERs management, FHA insuring, and document management (imaging). CBX’s flexible rules-based architecture allows TITAN clients to define field level decision trees, priorities, checklists and process management specific to an investor product variance or a cross-investor climate. 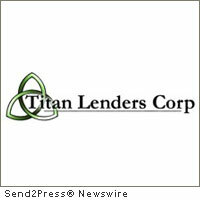 Titan Lenders Corp. (www.TitanLendersCorp.com) is one of a specialized few providers of mortgage back office fulfillment services, a not-well-understood facet of mortgage lending that includes closing, funding, and post closing services. Community banks, credit unions, mortgage bankers and brokers, and warehouse line lenders use outsource providers strategically to minimize compliance risks in a time-sensitive error-averse environment. Fluctuations in mortgage lending volume also lead some mortgage lenders to outsource their entire back office operation and secure predictable “per transaction” pricing rather than maintaining an inflexible static in house staff. TITAN is a preferred provider for some of the nation’s largest mortgage bankers and warehouse lenders. Original Keywords: MT Top Service providers, mortgage fulfillment services, mortgage back office services, Mary Kladde, Ruth Lee, Titan Lenders Corp, SaaS, Colorado business news Titan Lenders Corp Denver Colorado DENVER, Colo.
REFERENCES: Awards and Honors News, MT Top Service providers, mortgage fulfillment services, mortgage back office services, Mary Kladde, Ruth Lee, Titan Lenders Corp, SaaS, Colorado business news Titan Lenders Corp Denver Colorado DENVER, Colo.